VB Kanchi Veerans pulled off a sensational 14-run win over Lyca Kovai Kings for their first points in the 2018 Sankar Cement TNPL in a low-scoring encounter at the ICL Sankar Nagar ground in Tirunelveli on Sunday, July 29. Both sides struggled on what proved to be a difficult wicket to bat on. In the end, it was superior fielding and bowling efforts from the Veerans that saw them clinch their first win of the tournament after suffering four successive losses. Today’s defeat makes Kovai Kings’ spot in the Playoffs doubtful. Kovai Kings had a disastrous start while chasing a target of 117 runs after losing their openers early. 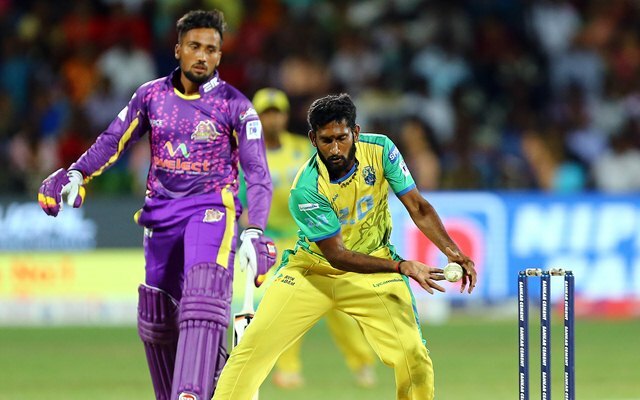 The turning point of the match was when Veerans’ left-arm spinner Aushik Srinivas removed a well-set Ashwin Venkataraman 35 (37b,3×4) stumped to leave Kovai Kings them struggling at 91/6. At that point, Kovai Kings required 26 from 13 balls with the tail remaining. R Divakar conceded only two runs in the penultimate over. K Deeban, bowling the last over, ensured a 14-run victory. Aushik Srinivas was the hero of the match for Veerans with a spell of 3-12 in four overs. Earlier, Veerans batting struggled against a high-class Kovai Kings bowling attack. Veerans made three changes to the team from the last outing and one of them was opener S Arun who scored 29 (30b,3×4,1×6). Captain Baba Aparajith remained unbeaten on 41(32b,2×4,2×6) to lift the side to 116/8 in 20 overs. Left-arm spinner S Ajith Ram was the leading wicket-taker for Kovai Kings with 3-16 while left-arm pacer T Natarajan bowled an extraordinary spell of 4-1-9-1. VB Kanchi Veerans 116/8 in 20 overs ( B Aparajith n.o. 41, S Arun 29, S Ajith Ram 3-16, T Natarajan 1-9) bt Lyca Kovai Kings 102/9 in 20 overs ( Ashwin V 35, Aushik Srinivas 3-12, R Divakar 2-16) by 14 runs.